Quando visiterai la tua crociera a Helsinki, scoprirai le attrazioni principali della capitale finlandese e l'incantevole città di Porvoo con un'escursione a terra di 6 ore. Durante un tour panoramico in pullman, visita i monumenti di Helsinki come la Finlandia Hall e la Chiesa di Temppeliaukio; e fermati per le foto al Monumento di Sibelius e alla Piazza del Senato. In seguito, prosegui verso il grazioso Porvoo del XIV secolo. Fai un tour a piedi del centro storico per vedere la sua cattedrale, i cottage in legno e le case a schiera dipinte di rosso; visitare un negozio di cioccolato; e goditi il ​​tempo libero per fare shopping e passeggiare prima di tornare in nave. Nice tour but to be honest I would not recommend the tour of Porvoo. It took almost one hour to drive each way and we were given about one hour of free time there. The part of the old town that we visited was nothing more than a tourist center. Personally I would have preferred to spend more time in Helsinki. This trip was overpriced. We were driven to Porvoo and walked to a church then got a bathroom break, coffee and a cake prior to 20 minutes of free time to shop then drive back to Helsinki to see another church and shop some more. Loved, loved, loved this tour!!!! 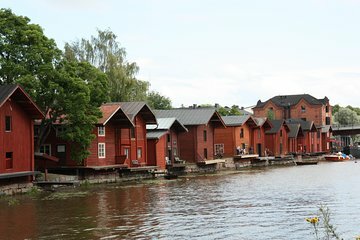 Porvoo was wonderful and soooo beautiful!!! Wish we had more time there. Our guide Rita was so engaging and friendly - loved her energy and her love for Finland!!!!! Very knowledgable and she made the tour fun and wonderful!!!! We had an excellent tour guide,Maria. We went to Porvoo early in the day and then did the best of Helsinki highlights later in the day. This was a great idea that allowed us to avoid large crowds and allowed flexibility to ensure we were back to the ship with plenty of time to spare. Our tour guide was very knowledgeable and personable and made the drive to and from Porvoo very informative and entertaining. We loved Porvoo! This was a 5 star experience! Excellent tour with wonderful English speaking guide. It was a bus tour through Helsinki with several stops to see important Helsinki statues and busts. Porvoo Town was very small and cute. More time probably needed to fully explore the shops and restaurants in Porvoo. The bus was very comfortable and pickup times were adhered to. 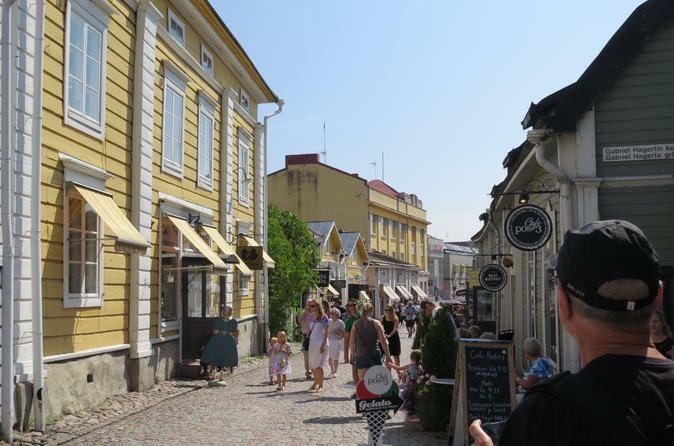 This tour was a great introduction to Helsinki and Porvoo, and our guide Rita was knowledgeable and engaging. I would highly recommend this tour, especially for first-timers, as it gives you both the city and the countryside. We throughly enjoyed this trip. So I would recommend it. This trip was very good and the guide was good. Would recommend this tour to anyone. They were mindful of the time because we had to be back at the ship at a certain time. Excellent tour guide. Knowledgeable and professional. An excellent day - in the morning we visited the Sibelius monument set in a wonderful park opposite the beach, the intriguing Rock Church and the beautiful Cathedral with plenty of time for looking around each of them. We also had time to explore the produce and crafts market. The fruit and vegetables on sale were wonderful - especially the raspberries. Our guide. Cornelia, was a delightful lady who spoke excellent English and we were lucky to be just a small party of 10 people. From Helsinki town we then travelled out through the countryside for about 50 kilometers to reach the medieval town of Porvoo. We saw the old wooden shore houses and then walked up to the cathedral, and down again to the old town where there were some delightful shops and restaurants. We had time here for lunch and also to visit the chocolate shop to tase the Finnish chocolate before travelling back to port to rejoin the ship.